* Guidelines - how to read the charts on this website. * Automatic sliding images above show an overview of all MT analysis and forecasts.
. as shown in symmetry uptrend chart ( left), price has already hit flip target ( blue ) at 1327.06.
level 200% (Fib) at 1339.55 (beige rectangle - body of candle at 1339.55 and wick at 1347.00). 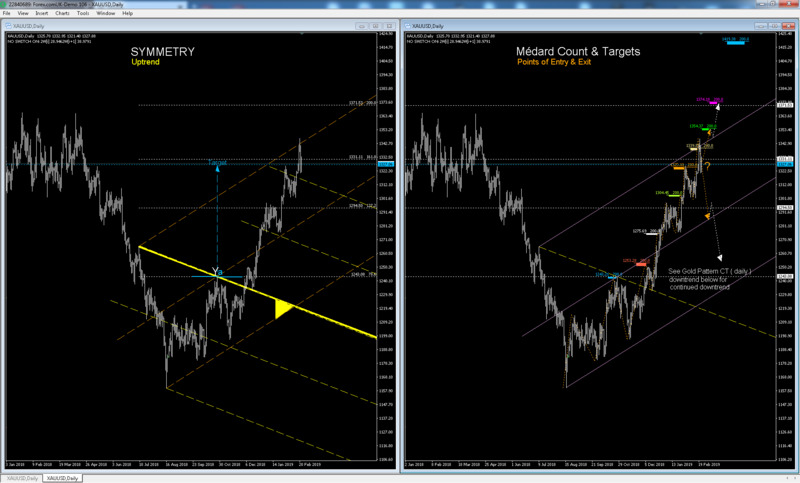 The Médard count & targets (mc&t) forecasts that price would then hit fib at 1354.37 (green rectangle). of the Andrews Pitchfork (apf).
. At that point, price may still resume its uptrend all the way back to fib at 1354.37 (green rectangle).
. as shown in the médard ct pattern above, price has already hit Fib e200% at 1325.16 ( orange rectangle). rectangle - body of candle at 1339.55 and wick at 1347.00 ) before pulling back. MOMENTUM CAUSING IT TO reach the middle line of the Andrews Pitchfork (apf). the Médard ct pattern FORECASTS THAT PRICE WILL THEN HIT fib at 1253.63 ( bleue rectangle) and beyond.